KINSTON, NC - The Carolina League awarded Grainger Stadium as the Field of the Year on Friday after a league-wide vote by managers and their coaching staffs. 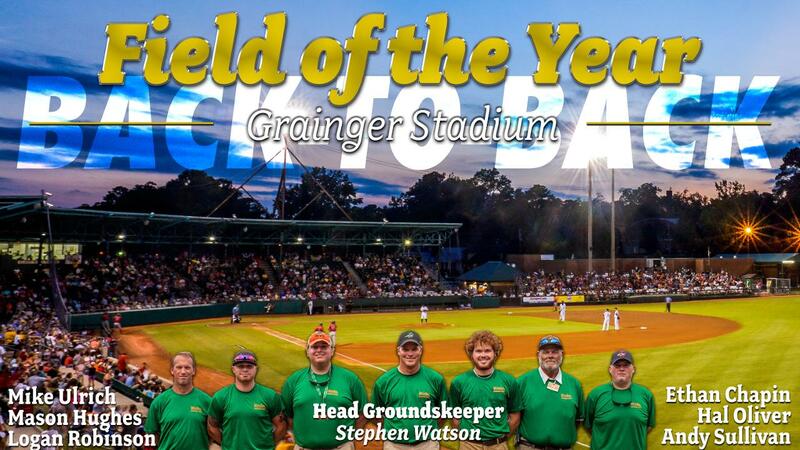 Head Groundskeeper Stephen Watson earns the honor for the second straight season and is named Sports Turf Manager of the Year in the Carolina League. "I certainly want to thank [assistant groundskeepers] Ethan [Chapin] and Logan [Robinson] for all of the work they've done this year and my crew that's done a fantastic job," Watson said. "I could not do this without them." Watson's crew included assistant groundskeepers Logan Robinson and Ethan Chapin, as well as Mason Hughes, Hal Oliver, Andy Sullivan, and Mike Ulrich. Grainger Stadium finished in first or tied for first in 10 of the 11 categories; accumulating a score of 47.80 to earn the title - a higher score than last season. Salem's Haley Toyota Field finished second and Carolina's Five County Stadium earned third place. "There's nine other groundskeepers in this league that are doing the same things I'm doing and they're fighting the same battles," Watson said. "I certainly give a nod and our hat off to them as well." The award is the third overall for Watson since he took over at Grainger Stadium in 2008. He also earned the honor in 2009 with the Kinston Indians. "It's support from my coaching staffs, it's support from the city, helping me maintain it along the way."